Article originally published [here] on November 6 2017. 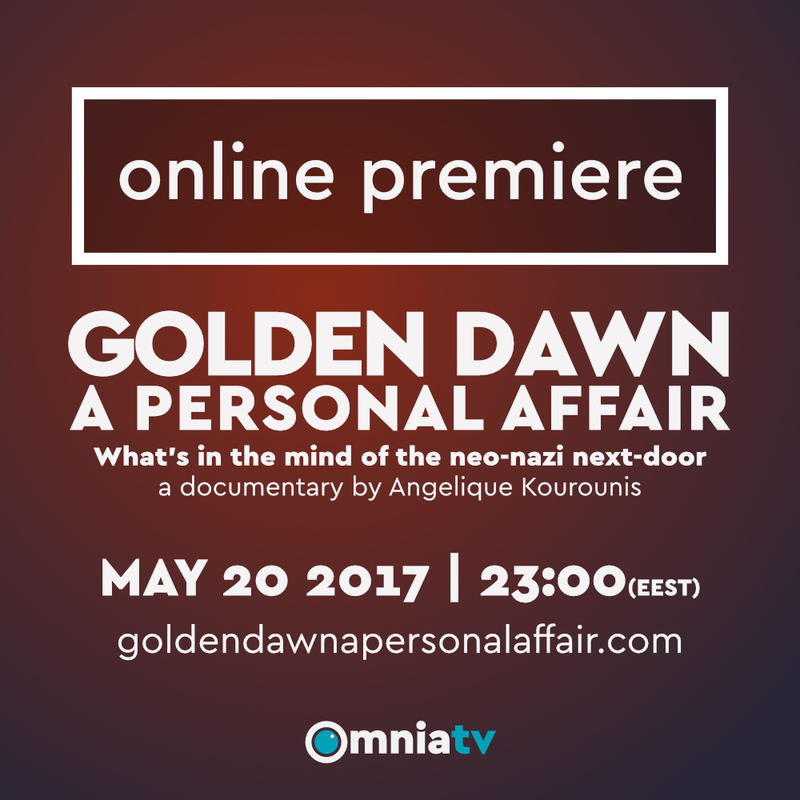 In the spring of 2017, when I was interviewing Golden Dawn followers for a research project, some of the movement activists that I encountered refused to be interviewed because of “that film that just came out.” As I later learned, they were referring to the documentary by Angélique Kourounis Golden Dawn: A Personal Affair. When I watched it later on, I understood why. Since 2012, Golden Dawn has been featured in at least one documentary per year. Konstantinos Georgousis’ The Cleaners (2012) follows Golden Dawn candidates in the center of Athens in the run-up to the 2012 election that catapulted the organization from the fringe to the center of Greek politics. Guy Stallaman and Kate Mata’s Into the Fire (2013) focuses on problems faced by migrants in Greece. Aris Chatzistefanou’s Fascism Inc., released in 2014, outlines economic factors that gave rise to fascism in the interwar period and highlights the similarities between today’s Greece and pre-war Germany and Italy. Finally, Marsia Tzivara’s Burning from the Inside (2015) shows the reaction of the Greek anti-fascist movement, especially in Berlin, to a rise of right-wing extremism. Following in the footsteps of these documentaries, Kourounis’ film completes the picture of how the far right made it to the Greek Parliament, a topic of an increasing scholarly interest since the Golden Dawn came in fifth with 7% of the vote in the 2012 general election. Yet, it is different from the previous films on this topic as it presents a sober overview of the factors that led to Golden Dawn’s staggering rise. Some of these factors have to do with devastating effects of austerity on the Greek economy – skyrocketing poverty levels, compressed wages, high unemployment rates – and on the Greeks’ pride as individuals and as a nation. The documentary outlines several institutional factors that contributed to Golden Dawn’s rise: the complacency of police; the ineffectiveness and partiality of the judicial system; the role of school education in the promotion of nationalism; and support for Golden Dawn’s ideology from members of the Orthodox clergy. Kourounis adds to this list another under-researched issue: the impact of Golden Dawn on the mainstream right-wing party New Democracy. Psephologist Ilias Nikolakopoulos stresses that Golden Dawn’s rhetoric centered on the Greek civil war was targeting the center-right New Democracy, the ruling party at the time, and not the left-wing opposition party Syriza as is widely perceived. The reason for this is that Golden Dawn could come second only if New Democracy failed in the subsequent general election. New Democracy, at the same time, responded to Golden Dawn’s criticism by shifting its rhetoric regarding immigration policy to the extreme right. The film discusses Golden Dawn’s populist strategies, such as its “social policies,” which involve the distribution of food, or blood donations exclusively for Greeks. Kourounis also shows how Golden Dawners use violence as a political strategy. She films high-ranking members’ insults on camera; its spokesman beating left-wing MPs on live TV and attacking reporters; its members assaulting a theater for putting on a play that they deem inappropriate; and activists’ aggression during public events such as in Meligalas, when one of them attacked Kourounis for filming. The filming was done in Athens in the spring of 2014, when Golden Dawn was preparing for both regional and European elections. By that time, dozens of Golden Dawn members and MPs, including its leader, Nikos Michaloliakos, had been arrested after the assassination of the musician Pavlos Fyssas in September 2013. Charges against them range from attempted murder and assault to a creation of a criminal organization. At the time of writing, the trial of 69 defendants is still ongoing. As Kourounis notes, the incarceration of its leaders was turned into an asset. At Golden Dawn’s pre-electoral gatherings, Mihaloliakos addresses his supporters from jail by telephone as a martyr and a hero. Harris was elected to the municipal council in May 2014. Since the time that Kourounis’ documentary was filmed, Golden Dawn has been established as the third largest political party in Greece. 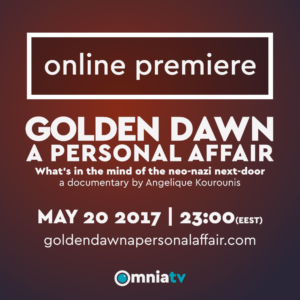 A high percentage of Greeks believe in Golden Dawn and mistrust “the system,” despite the fact that, in Kourounis’ words, “Golden Dawn never hid its ideas.” And Golden Dawn: A Personal Affair is one of the most comprehensive documentaries that recounts how this came to be. In one of the most talked about documentaries at the 18th Thessaloniki Film Festival, Angelique Kourounis tries to understand what is in the mind of the Golden Dawn supporter next door. And her report is shocking and worrying. 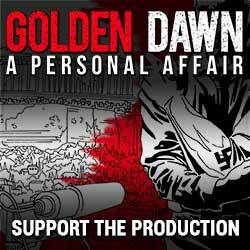 Golden Dawn: A Personal Affair – What’s in the mind of the neo-Nazi next door?